It’s no secret I have a major weakness for frozen desserts. Ice cream, milkshakes, margaritas, you name it, I love it! But my favorite frozen treat of all time? 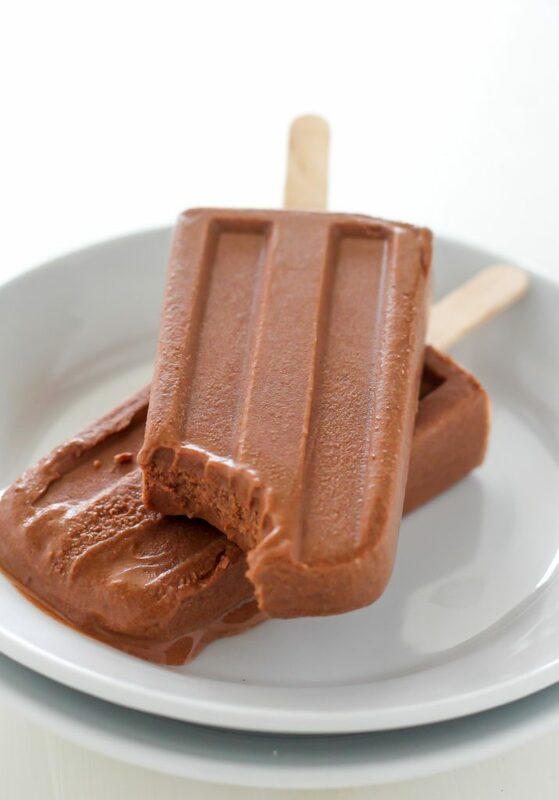 FUDGE POPS. They’re basically Summer on a stick! And once the warm weather rolls in, I want them on the daily. 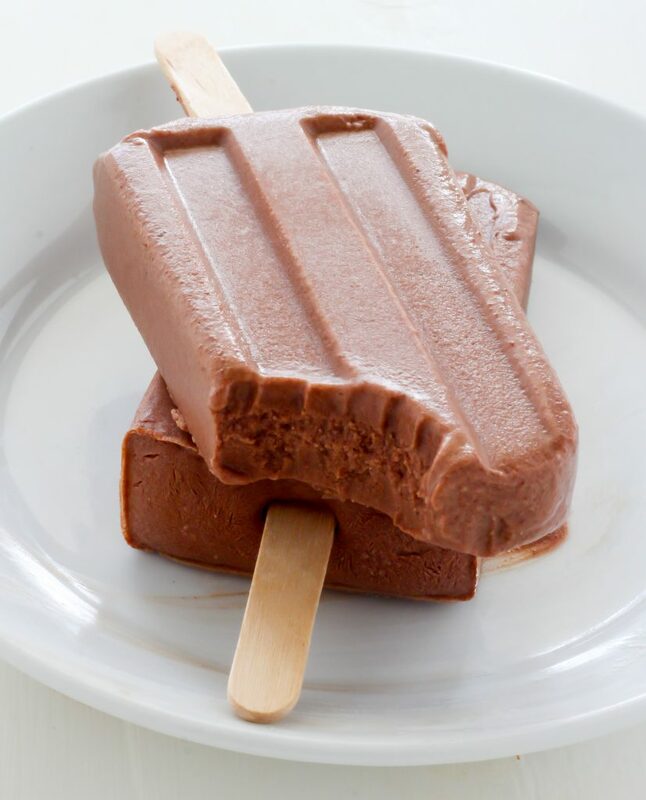 And thanks to this healthy fudgesicle recipe, now I can!!! 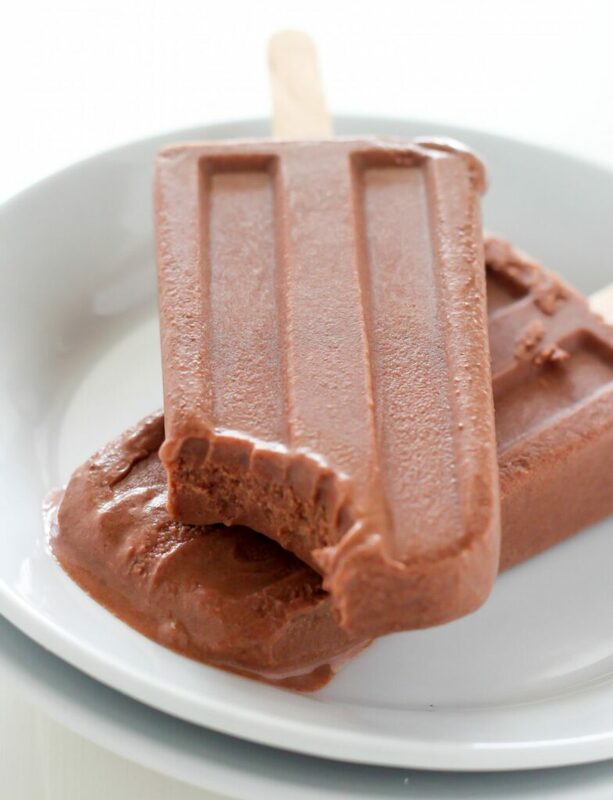 Made with just 4 healthy ingredients, you can enjoy these fudge pops guilt free! Alright! Let’s jump into the delicious recipe details head first. 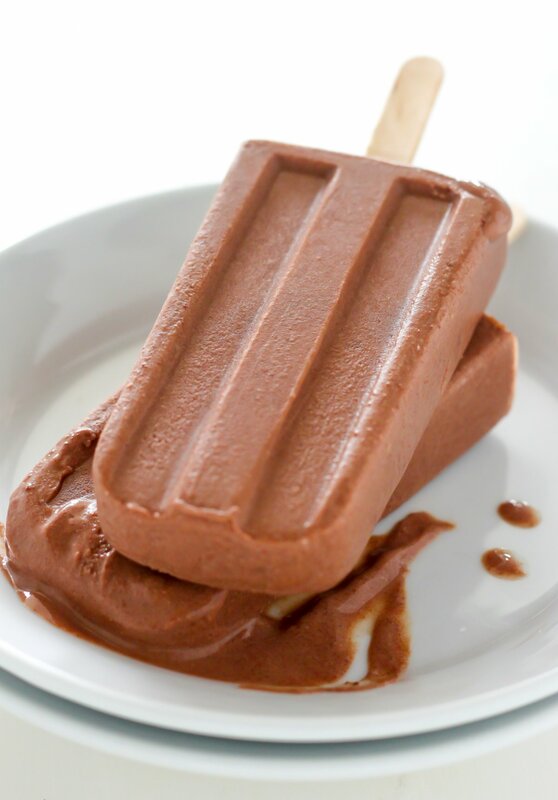 This recipe is my take on the classic fudge pop. I’ve stripped the ingredient list down to include just 4 basic products: Greek yogurt, semi-sweet chocolate, milk, and vanilla. SO simple, right? For the Greek yogurt I do recommend using full-fat, but reduced fat and fat-free Greek yogurt may be used if you don’t mind a slightly less creamy pop. For the milk anything from cow’s milk to your favorite non-dairy milk beverage will work. I love (LOVE LOVE LOVE) using chocolate almond milk in this recipe, and if you don’t have a nut allergy, highly recommend you give it a try! My second favorite milk option is using whole cow’s milk, which gives these pops an extremely creamy texture. For the chocolate I recommend using your favorite brand of semi-sweet chocolate chips. 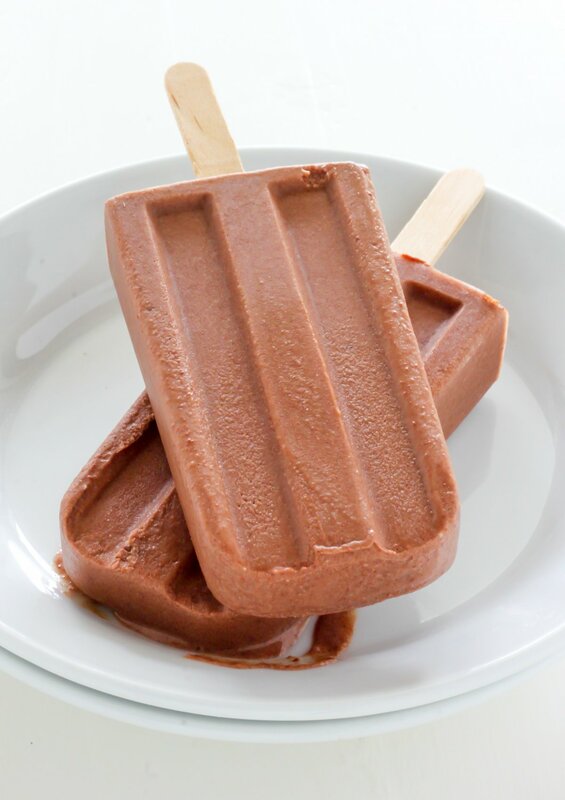 The chocolate flavor really shines through in these pops, so using good chocolate – or at least a chocolate you know you enjoy – is a must. I always use Ghirardelli Brand Semi-Sweet Chocolate Chips in these pops, which are easily found in most grocery stores and online. For this recipe you’ll also need a popsicle mold and popsicle sticks. Making this recipe is also seriously simple! You’ll melt your chocolate in a small saucepan over medium-low heat, stir in your milk and bring to the gentlest simmer, then remove the mixture from heat and cool for a few minutes. Once cooled, stir in your Greek yogurt and vanilla, run this mixture through a sieve, and pour it into your Popsicle molds. This takes like 8 minutes total! Pro Popsicle Making Tip: Freeze your pops for about 1 hour before inserting the Popsicle sticks. Semi-freezing the fudge pops first helps ensure you won’t push the stick in too deep. Freeze these babies for a few hours before digging in! If you’re new to Popsicle making, this is a wonderful recipe to start with. The ingredient list is short, the method is easy, and the results are magnificent. You got this! Here’s the link to the Popsicle tray that I used for this recipe and love dearly! 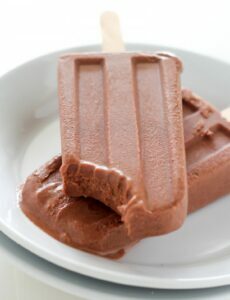 Cold and creamy Chocolate Fudge Pops make with Greek Yogurt! Ohhhh no. Oh no, this is too good. I -love- fudge pops. And I have all of these ingredients. AND I just bought the holders/molds so I can actually make them. It’s fate. And I love chocolate almost milk. Goddess help me. Hi J.S.! Yesssss!!! It’s fate 🙂 I hope you enjoy them and all their chocolatey goodness! incredible—so simple and so refreshingly decadent!!! any idea how many calories might be in this? They look so yummy! 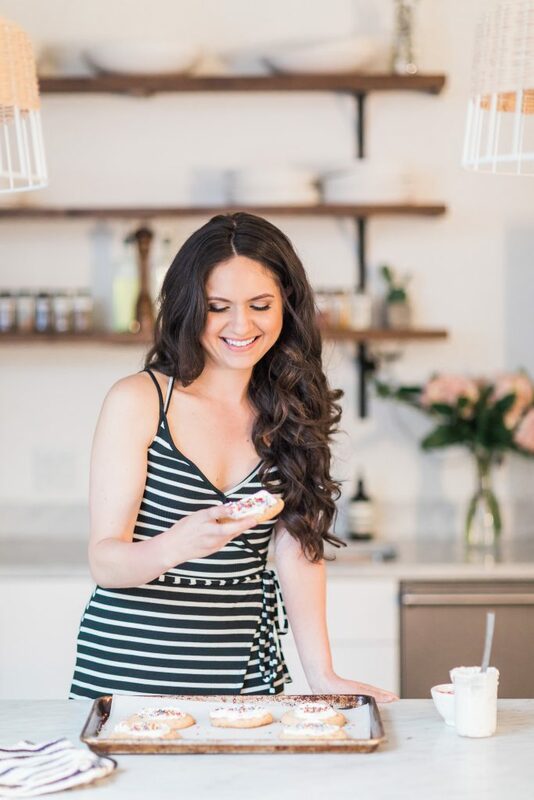 If you are looking for nutritional counts… You can use My fitness pal App or the Sparkpeople.com website has a recipe calculator, and you don’t have to register to use it. Thank you much for this wonderful healthy recipe! I am going to make some for my husband. He’ll really appreciate them in this Atlanta heat! I bought the molds for the popsicles. 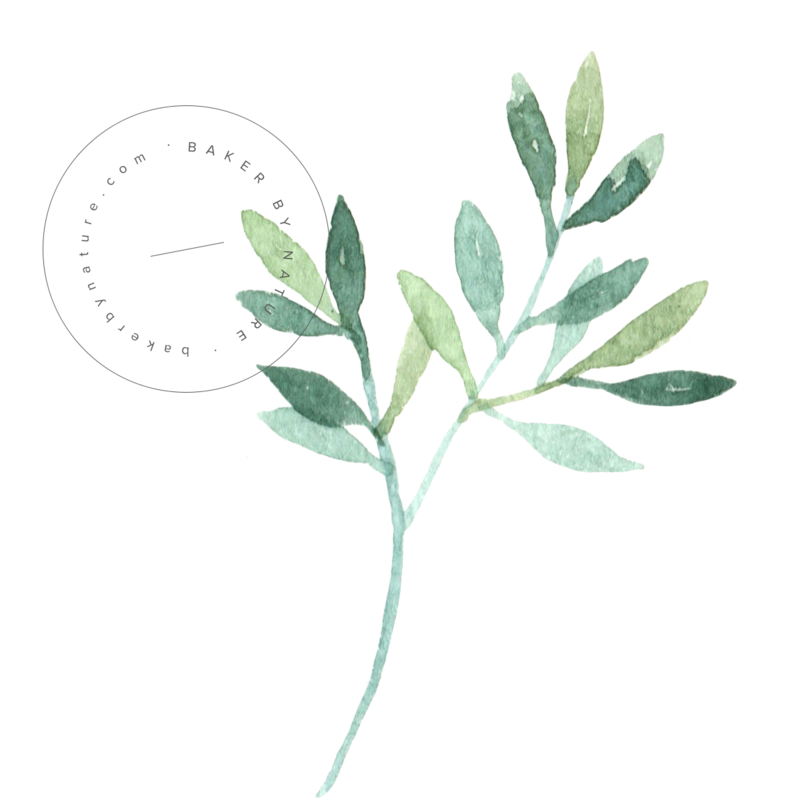 Do you need to wait an hour to add the top/stick or can it be done right away? Hi Elaine. Wait an hour (or even just 45 minutes) then add in the stick. If you purchased the same molds as I have, you can put the top on (it has slits) then just slide in the sticks later. I hope making these pops would be fun and my kids would enjoy eating them. Looks Amazing !!! These are decadent and delicious. They are VERY rich. Definitely not low cal. Hi Elaine. So happy you enjoyed the recipe! Thank you for this easy & yummy recipe! My family and I love these and I now make them on a regular basis! Sooo good! Any idea on the nutrition on these? Please advise ASAP! Hi Diane. I do not provide nutrition information at this time, but there are many apps out there that can do this for you. This was amazing!!! So creamy and full of flavor! 🙂 Most definitely making it often during the summer! I am curious what the purpose of putting the mixture through the sieve is? I only ask because I don’t have one and would love to make these! Hi Marie. It makes the texture smoother. You can still make them… but they may be a little grainy if you skip the straining. So excited to give these a try! Love the healthier option! I was wondering if you could substitute banana for the chocolate? They used to sell both the banana and chocolate fudge pops in a pack when I was growing up. And now I can’t find the banana fudge pops anywhere! I made these with Hershey’s chocolate milk and didn’t use a sieve. It left teeny tiny bits of chocolate in it and I loved that! I had Popsicle sticks but no molds so I used small glasses. Oh my God these were good. I can’t wait to make them for my kids when they come home. I’m pinning this one!! Thank you! Hershey’s chocolate milk in place of which ingredient? Absolutely delicious! Not to meantion easy. I’m keeping this recipe on hand for sure. I am making these for my health class for a healthy recipe project! Hope they are good!!! I have to say, I come back to the recipe all the time! We love these in our house. Such a (relatively) healthy sweet treat! YAY! Also, I’m so jealous of your weather, Zoe 😉 It’s been snowing here all week. I need visit Sydney again soon. Thanks for letting me know the recipe was a success!!! Wow this are melting my mouth. My cooking blog is in spanish with google so I hope you liked. Yummy! I am pretty sure if me and my three year old make these, he will devour them! I have a question-can you substitute the ghiradelli cocoa powder instead of the chocolate chips? (not sure what the ratio of powder would be though for this recipe?). Also, can you include lactose free milk (or dairy milk)? I am dairy free, but my son isn’t, and for him usually try to keep the healthy fat content high because he is low on the weight scale. (I wasn’t sure if it changed the consistently, or more for a lower fat alternative you are using dairy free milk). Thank you! I have non fat vanilla greek yogurt – would you make any changes except maybe removing the vanilla? Just an FYI for those using the Zoku Mod Pop molds, it will make about 6 pops.